How can we talk about Charles Whitman? How should we talk about Charles Whitman? Some of his victims and some of the witnesses to his killing rampage don’t even want to say his name. He was a “monster,” a “madman,” a murderer and nothing more. In Tower, Keith Maitland’s moving 2016 film about the heroism of the victims and survivors, Whitman’s face is never seen. This is a historical shift from the first months and even decades after the shooting, when Charles Whitman was the main focus of attention. In the early stages, horror and incomprehension prevailed. How could he? Who was he? Governor John Connally convened a special commission, which released a report just 5 weeks later, to try to answer those questions. As Dr. Coleman de Chenar, the pathologist who performed the autopsy on Whitman, said, the shooter was “an anti-social psychopath, and that’s the worst kind.” He could be be social and friendly and make a good impression, but he concealed deep hostilities.1 Life Magazine also presented Whitman from two sides. He was big, strong, handsome, neat, hardworking. He was pleasant to be around and interesting to talk with. He spoke ill of no one – except, occasionally, his father – and he tried to speak well of many people. His grades were excellent. He enjoyed civic work, loved his wife, admired his professors and seemed to have no enemies. In the last decades of the 20th century, ironic references to Whitman were the norm. He was the Marine and Eagle Scout who turned into a mass murderer. As Rosa Eberly noted, his name appears in numerous films, from made-for-tv movies to indie classic, Slacker, to Stanley Kubrick’s Full Metal Jacket.3 But media attention to the increasing number of lone shooter mass murderers has led many observers to believe that the media itself enables copy-cats and leads to more violence by making them famous media stars. This view seems to indicate a belief that such lone mass shooters crave publicity for suicidal stunts; that they are cruel and indifferent narcissists. But the fact is that we still do not know what makes someone carry out a mass attack. This view might also suggest that the shooter’s motives and identity are irrelevant in light of the trauma they caused. Is curiosity and the desire to understand mass murderers a symptom of the modern media circus? Is empathy only available to people at a distance? Does a need to start paying more attention to the victims and the survivors mean that we have to stop trying to understand the perpetrators? 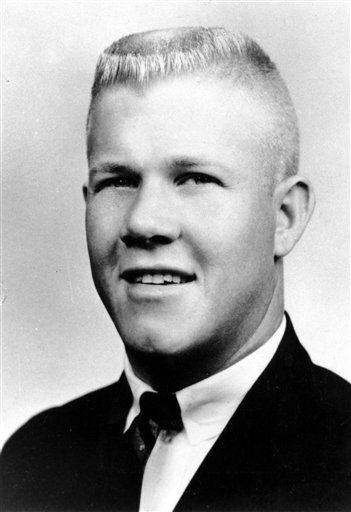 Charles Whitman suffered abuse as a child, anxiety as an adult, and serious physical and mental illness in the months (and maybe years) before he slaughtered 16 people, wounded 32 others, and traumatized many more. He sought help from an unfeeling psychiatrist for the violent impulses that terrified him. Should we spare some sympathy for him? Or, do we talk about how he was an Eagle Scout at age 12? How he excelled in the Marines and received a prestigious scholarship to UT Austin? Do we talk about how he struggled to succeed in life when neither his father nor his superior officers were telling him what to do? Do we talk about the total lack of “red flags”? Or all the signs of trouble that emerged in the years that followed? The stressful marriage, the stressful college career, the stressful military career, the friends who said Kathy told them that Charlie hit her, the brain tumor, the psychiatrist, the diary where he confessed first his fears and later his most irrational thoughts about killing his wife and mother? Do those experiences explain the man who murdered the women he loved most before becoming the cold-blooded sniper? As historians, we believe that it is our job to study and report on the whole event – perpetrator and victims and eyewitnesses alike. Eleven out of the twelve co-authors of this website found that the more they learned about Whitman’s own struggle, the harder it was to resist some empathy for him. One student, though, found that no matter how much she learned about Whitman, he did not elicit any of her sympathy. Was Charles Whitman a monster or sufferer? Was he a sociopath or mentally ill, or was his brain deformed by a tumor? Do you want to vilify or sympathize with him? As we struggle to contain accelerating gun violence in the U.S., at least let our choices be based on research and evidence rather than on prejudice and preconception. Behind the Tower is a project of The Public History Seminar at UT Austin and was initially published the summer of 2016.